Below you fill find all funeral homes and cemeteries in or near Ketchikan. Suburbs of Ketchikan: Edna Bay, Kasaan, Naukati Bay. Ketchikan is also known as: Ketchikan Gateway Borough / Ketchikan city. Their current mayor is Mayor City council. Zip codes in the city: 99901, 99903, 99918, 99919, 99950. Prince Wales Ketchikan County funeral flowers can be purchased from one of the local funeral shops we partner with. Ketchikan has been featured in films like: Spawn of the North (1938), and The Silver Horde (1930). Some of the notable people born here have been: Lisa Murkowski (lawyer and politician), Kyle Johansen (consultant), and Danny Edwards (golfer). Ketchikan (/ˈkɛtʃɨkæn/, KETCH-ih-kan) (Tlingit: Kichx̱áan) is a city in the Ketchikan Gateway Borough, Alaska, United States, the southeasternmost city in Alaska. With a population at the 2010 census of 8,050, it is the sixth-most populous city in the state, and tenth-most populous community when census-designated places are included. 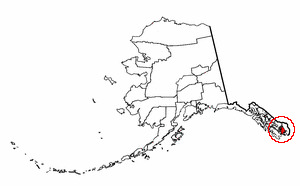 The surrounding borough, encompassing suburbs both north and south of the city along the Tongass Highway (most of which are commonly regarded as a part of Ketchikan, albeit not a part of the city itself), plus small rural settlements accessible mostly by water, registered a population of 13,477 in that same census. Estimates put the 2014 population at 13,787 people. Incorporated on August 25, 1900, Ketchikan is the earliest extant incorporated city in Alaska, because consolidation or unification elsewhere in Alaska resulted in dissolution of those communities' city governments. Ketchikan is located on Revillagigedo Island, so named in 1793 by Captain George Vancouver.Ketchikan is named after Ketchikan Creek, which flows through the town, emptying into the Tongass Narrows a short distance southeast of its downtown. "Ketchikan" comes from the Tlingit name for the creek, Kitschk-hin, the meaning of which is unclear. It may mean "the river belonging to Kitschk"; other accounts claim it means "Thundering Wings of an Eagle". In modern Tlingit this name is rendered as Kichx̱áan. Ketchikan Creek served as a summer fishing camp for Tlingit natives for untold years before the town was established by Mike Martin in 1885. The area near the mouth of Ketchikan Creek later earned Ketchikan a measure of infamy during the first half of the 20th century for a red-light district known as Creek Street, with brothels aligned on either side of the creek.Ketchikan's economy is based upon government services, tourism and commercial fishing. Civic boosters have dubbed the community the "Salmon Capital of the World." The Misty Fiords National Monument is one of the area's major attractions, and the Tongass National Forest has long been headquartered in Ketchikan, mostly in the city's historic Federal Building. For most of the latter half of the 20th century, a large portion of Ketchikan's economy and life centered on the Ketchikan Pulp Company pulp mill in nearby Ward Cove. The mill closed in 1997 in the wake of the passage of the Tongass Timber Reform Act of 1990, which reduced timber harvest targets in the national forest.Ketchikan has the world's largest collection of standing totem poles, found throughout the city and at four major locations: Saxman Totem Park, Totem Bight State Park, Potlatch Park, and the Totem Heritage Center. Most of the totems at Saxman Totem Park and Totem Bight State Park are recarvings of older poles, a practice that began during the Roosevelt Administration through the Civilian Conservation Corps. The Totem Heritage Center displays preserved 19th-century poles rescued from abandoned village sites near Ketchikan. It was written on September 30th, 2018 that Clifford Titus Benson died in Everett, Washington. Benson was 87 years old and was born in Ketchikan, AK. Send flowers to express your sorrow and honor Clifford Titus's life. It was disclosed by The Statesman Journal on August 26th, 2018 that Logan Gage Wilson passed on in Salem, Oregon. Wilson was 32 years old and was born in Ketchikan, AK. Send flowers to express your sorrow and honor Logan Gage's life. It was disclosed on June 24th, 2018 that Dorothea "Dottie" O'Donoghue died in Ketchikan, Alaska. O'Donoghue was 80 years old and was born in Manchester E, . Send flowers to share your condolences and honor Dorothea "Dottie"'s life. It was reported by The Daily News on April 9th, 2018 that Ggwendolyn Wtyre (Jones) died in Seattle, Washington. Ms. Wtyre was 90 years old and was born in Ketchikan, AK. Send flowers to express your sympathy and honor Ggwendolyn's life. It was reported by The News Tribune on February 11th, 2018 that Don Taunt died in Tacoma, Washington. Send flowers to express your sympathy and honor Don's life. It was reported on November 29th, 2017 that David Lee Kuehl died in Ketchikan, Alaska. Kuehl was 52 years old and was born in Pasco, WA. Send flowers to share your condolences and honor David Lee's life. It was noted by Skagit Valley Herald on April 26th, 2017 that Rae Ann D'Amico passed on in Marysville, Washington. D'Amico was 75 years old and was born in Ketchikan, AK. Send flowers to share your condolences and honor Rae Ann's life. It was reported by The Herald on March 4th, 2017 that Lucille Mae Blake (White) died in Everett, Washington. Ms. Blake was 67 years old and was born in Ketchikan, AK. Send flowers to express your sorrow and honor Lucille Mae's life. It was revealed on February 17th, 2017 that Elizabeth LaVerne Thomeycroft perished in West Seattle, Washington. Thomeycroft was 94 years old and was born in Ketchikan, AK. Send flowers to share your condolences and honor Elizabeth LaVerne's life. It was revealed by The News Tribune on January 1st, 2017 that Annabelle I Johnsen passed away in Tacoma, Washington. Johnsen was 92 years old and was born in Ketchikan, AK. Send flowers to express your sorrow and honor Annabelle I's life. Planning a funeral can be overwhelming. iMortuary's goal is to assist you by providing comprehensive listings of the funeral providers in Ketchikan. Browse below to locate Ketchikan funeral services such as cemeteries, funeral homes, cremation providers and funeral flower arrangers. Known as the "Salmon Capital of the World" Ketchikan Creek is a major thoroughfare for Salmon during spawning season. The area is also popular with tourists, as it is not only a hub for charter planes and Alaska Airlines, but showcases the beautiful landscapes of Alaska including the Misty Fjords National Monument. In Ketchikan tourists and residents alike can view the world’s most extensive collection of totem poles. The official website for the city of Ketchikan is https://www.ktn-ak.us/. We work with local florists and flower shops to offer same day delivery. You will find budget sympathy flowers in Ketchikan here. Our funeral flowers are cheap in price but not in value.